How has it been a full month since my last Beauty Heroes post? Time sure is flying by and spring is almost here! 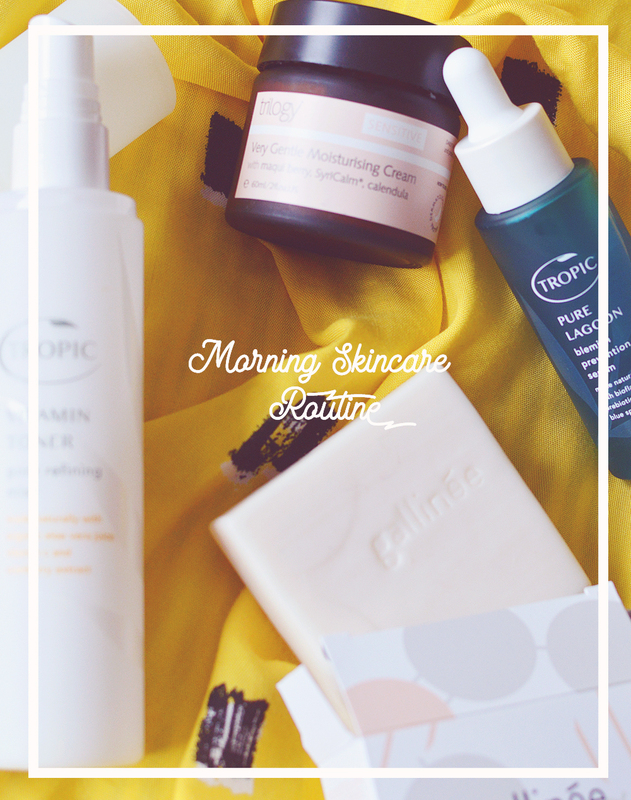 When I heard that the March Beauty Heroes box was going to include SkinOwl I was over. the. moon. Having used both the Lavender and Geranium Beauty Drops in the past I knew I was going to love the new Beauty Drops PM Mangosteen too. I'm always itching with excitement to receive my box and the two week wait from the announcement at the first of the month to me actually receiving my box is a rollercoaster of emotions. 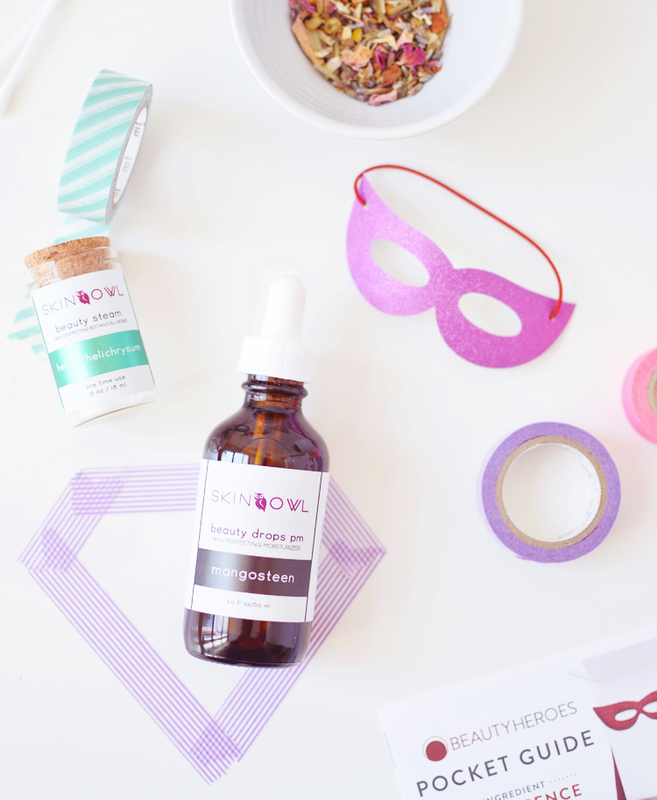 Inside this months box ($39) you will receive a full size Beauty Drops PM Mangosteen 60ml, worth $85 / £68 and a sweet sidekick exclusive to Beauty Heroes; a single use Beauty Steam named Heroic Helichrysum, worth $9. 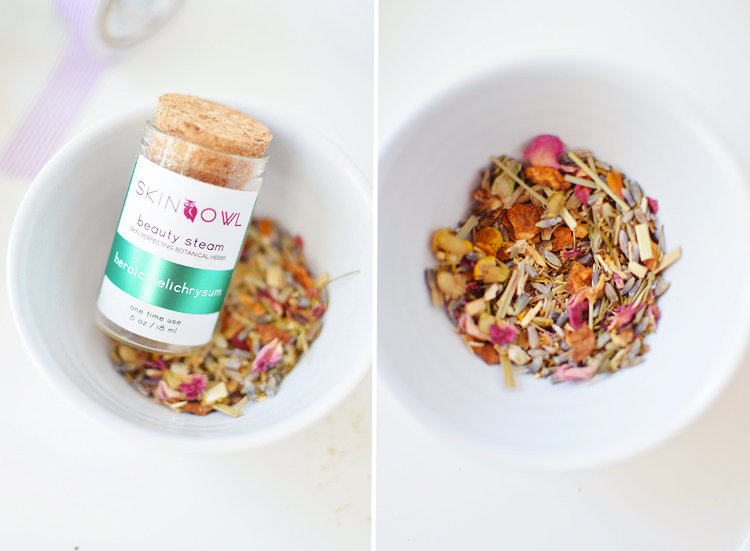 all-organic dried yarrow, helichrysum, cornflower, calendula petals, rose petals + buds, french lavender and chamomile. It's been so long since I last indulged in a facial steam and I can't wait to find a peaceful moment to get my R&R on. This smells predominantly of lavender and oh so calming, I can't imagine how delicious it's going to smell when the hot water releases all of that herbal goodness. Make sure to soak a flannel (or cotton pad) in the water after your steam is complete and press against skin for more skin benefits, too. I wonder if you can save the water to use as a facial mist afterward? If stored in the fridge for a week or two (strained) it should last, right?... I may give that a go! 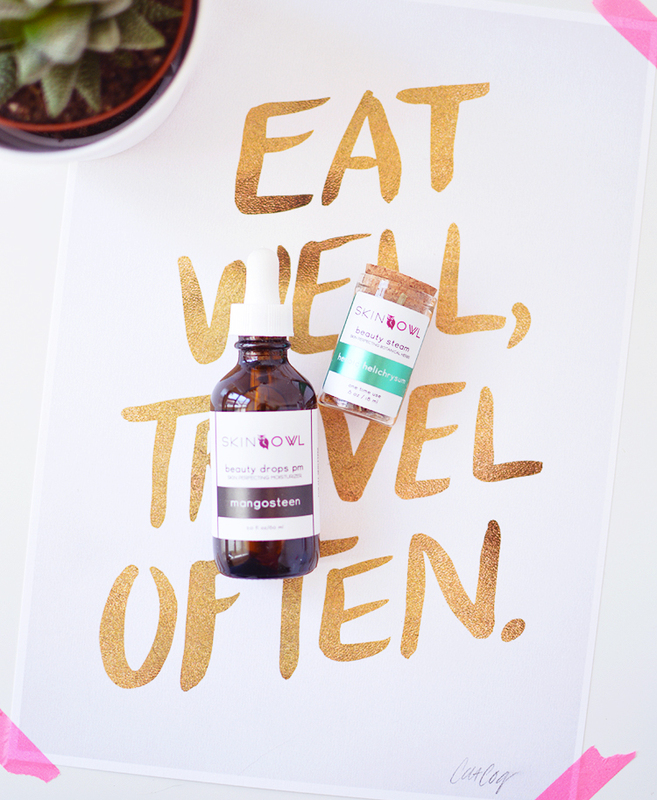 raw, organic, cold-pressed african baobab oil & pure mangosteen oil. I made a promise to myself not to open this until I'd used up at least one of the three facial oils I'm currently using on rotation. That promise lasted less than a day. I just had to see what all the fuss was about for this candy-like scent! To me the scent isn't like sweets at all, it immediately reminded me of something from my childhood, a strawberry bubble bath I think, the scent is so similar though it could just be my imagination making things up, as you can bet the bubble bath I used when I was 5 was artificially scented like fruit, but I know that this oil is as pure and natural as can be. The oil itself is clear and has a medium silky texture, it's not dry but it's also not too rich or greasy. I feel like dry/normal skin types will absolutely adore this oil, whilst oily skin will want to cut back on the suggested 10 drops a night (I'll be starting with just 2-3) and trial it every other night at first while you get a feel for it. My skin has recently rebalanced itself after being incredibly dry and dehydrated for a couple of weeks and I really wish I'd of had this oil then as I think it would have sorted my skin out a treat. Baobab oil is clearing, hydrating and calming. About the size of a small coconut, the baobab fruit (you may have heard of baobab if you're into your superfood powders) is loaded with vitamin C, magnesium, calcium and antioxidants, offering powerful free-radical protection as well as anti-viral and anti-inflammatory benefits. South-east Asian mangosteen, also known as "the queen of fruit" is deep purple in colour with white segments of fruit inside similar to an orange. The oil is soothing, calms inflammation, clears acne, protects from oxidative stress and fortifies skin with essential minerals. It has an incredibly high ORAC value (Oxygen Radical Absorbancy Capacity) that is up to 1600 times that of superfoods goji and acai, flooding cells with oxygen which inhibits skin-ageing inflammation. This intensive night-time duo is meant to visibly clarify and revitalise skin while you sleep, giving you a well-rested complexion that takes the term "beauty sleep" to new levels. Skin looks healthier, brighter, smoother and lines appear softened, too. What's not to love? 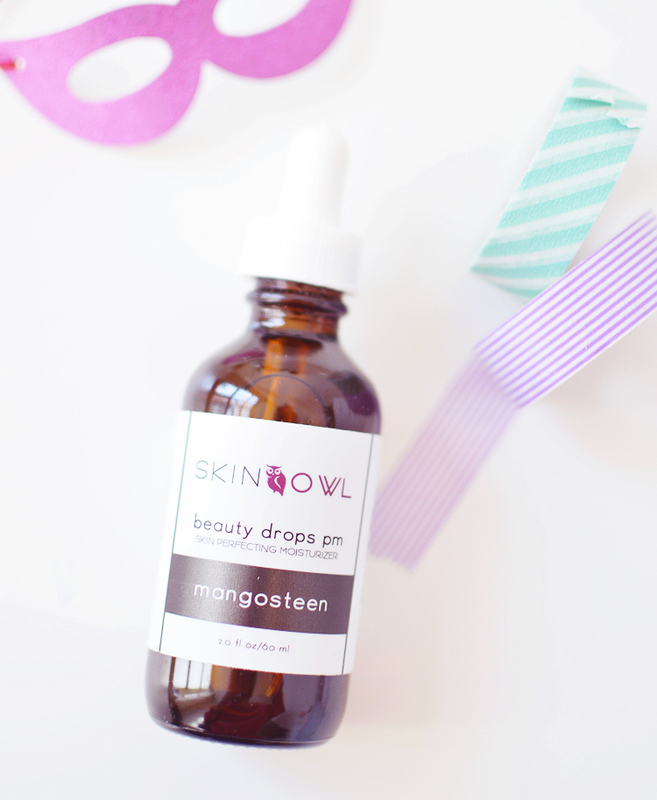 Take advantage of the 50% saving and subscribe to Beauty Heroes before March 20th to receive the Skinowl Mangosteen Beauty Drops & Heroic Helichrysum Beauty Steam for $39 (+ shipping). Beauty Heroes ships to over 30 countries and members always receive 15% off in their shop should you wish to repurchase or try any other products from the brands featured in their monthly box.